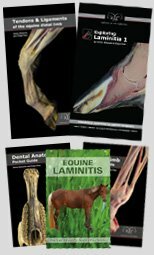 Following on from the success of the Hoof Anatomy Pocket Guide we have now produced the Equine Dental Anatomy Pocket Guide. 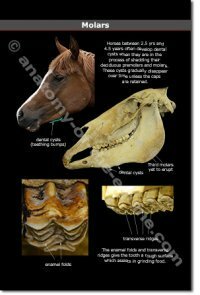 These high quality, full color, over-sized (8.5"x 5.5") dental anatomy postcards are bound together with spiral binding which makes them a wonderful learning resource for horse owners as well as the perfect educational tool for vets and dental specialist. 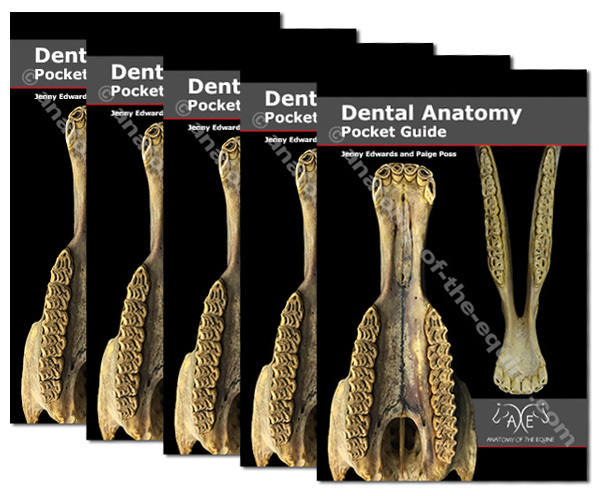 This portable teaching tool is invaluable aid in educating your clients on the basics of the dental anatomy. Available in both printed and digital (eBook) format. Here we have matched up an external view of the head with a view of the skull to give recognizable reference points. The skull has then been colorized to show each of the bones and all of the structures are clearly labelled. 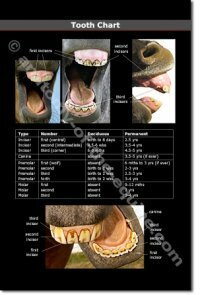 The tooth chart identifies each tooth and gives a timescale for when those teeth erupt which is very helpful when determining the age of a horse. The accompanying photos illustrate the eruption pattern of the incisors. This view of the skull shows the size and shape of the teeth in the upper arcades with each tooth clearly labelled. The lateral view shows the angle of the incisors and location of the canine teeth. This view of the jaw shows the lower arcades and the tables of the teeth. The front view is an exciting photo that conveys a lot of information. It shows the table angle of the premolars and molars and clearly illustrates how the jaw is much narrower than the maxilla. 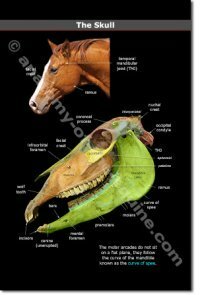 As the horse grows, it is interesting to see the changes in the teeth. 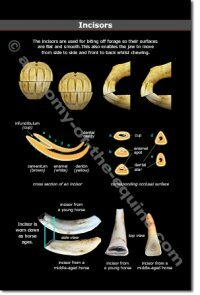 This page shows the deciduous (milk) incisors and highlights the difference in shape compared to permanent incisors. 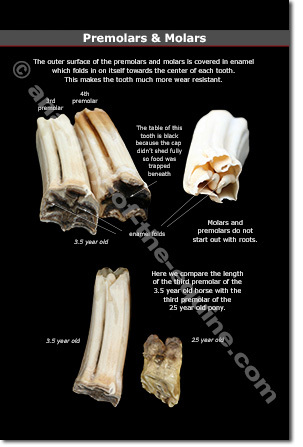 This is another useful tool when determining the age of a horse. 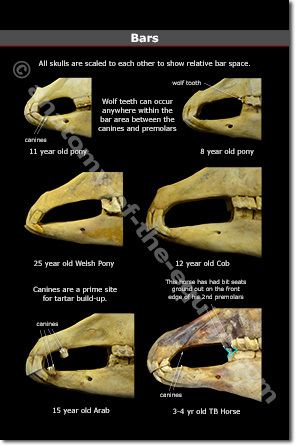 Clear images also illustrate erupting canines and show how they can cause problems when using a bit in a younger horse. When hidden beneath the gums, they can cause areas of great sensitivity. It is fascinating to see how the cap shed on this premolar. 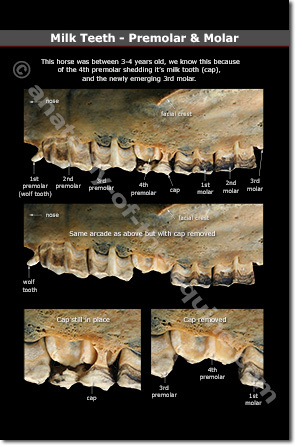 The clear images demonstrate why the milk teeth are known as 'caps'. For owners that have yet to experience finding a cap, these images show the natural exchange of deciduous (baby/milk) teeth for permanent teeth. 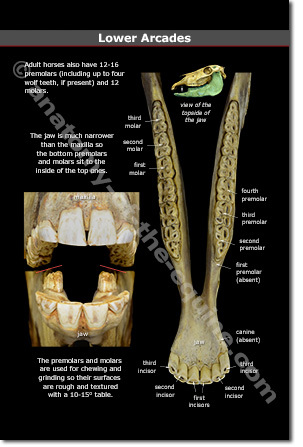 This page illustrates the size, shape and structure of the incisors. 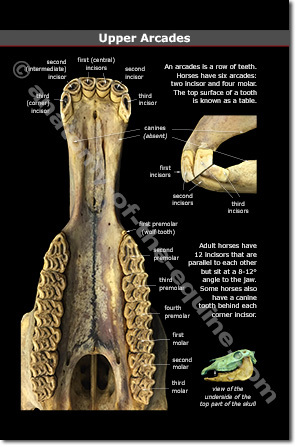 It also shows how the incisors wear and how the table of the incisor can tells us the approximate age of the horse based on the stage of wear. 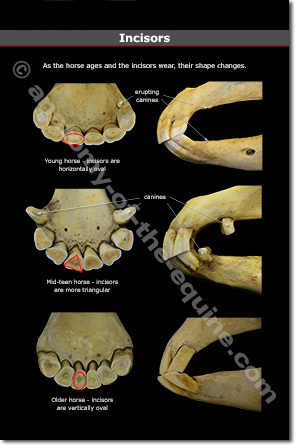 This set of photos illustrates how the the shape and angle of the incisors changes as a horse ages by comparing a young, mid-age and older horse. 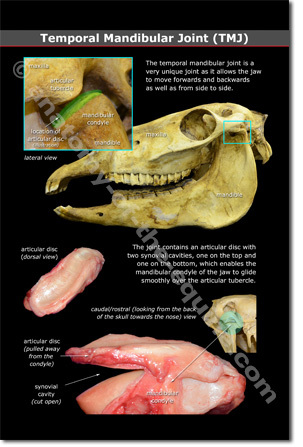 The first photos shows the full length of a premolar in a 3 1/2 year old horse. Many owners aren't aware just how much tooth lies beneath the gum. 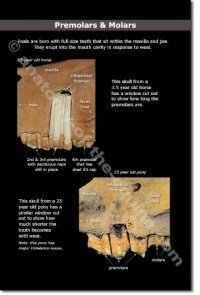 The second photo shows the premolar in an old horse and highlights how much shorter the tooth becomes through wear, as the horse ages. The premolars and molars have many folds of enamel to strengthen the teeth and make them more resistant to wear. The enamel folds also provide a rough grinding surface to help break down food as it is being chewed. 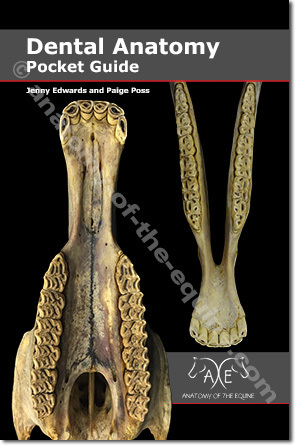 The two premolars from the previous page (young and old horse) are shown next to each other to highlight the difference in length. 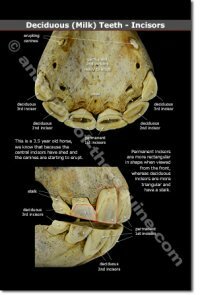 Young horses often develop dental cysts when they are in the process of getting their permanent teeth.These are know as teething bumps. The bottom photos show the transverse ridges that are formed by the enamel folds. These ridges are vital for efficient chewing and grinding. This series of photos shows the difference in size and shape of the bar area in a range of horses. Each photo is sized in relation to all the others and shows how important it is to consider this area when choosing a bit for the horse. 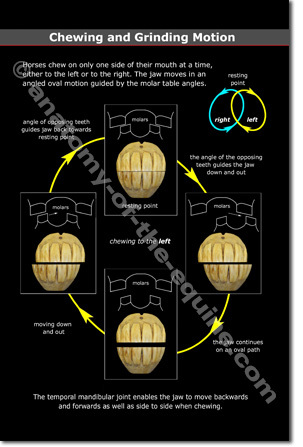 This page illustrates the chewing/grinding motion through a series of photos and illustrations. 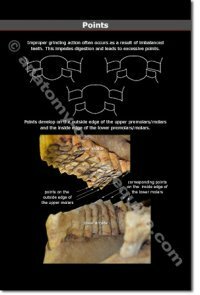 The incisor photos show what happens at the front whilst the illustrations show what's happening with the premolar/molars at the same points in the cycle. This page highlights how an improper grinding action can lead to excessive points on the outside edge of the top arcade and the inside edge of the bottom arcade. 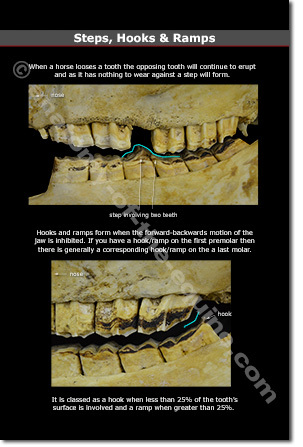 This range of photos show the problems that can occur when the teeth are out of balance. The first shows a wave, the middle photos show cupping of the incisors and the last photo shows a smile. Further photos that illustrate steps, ramps and hooks in the molar arcades. 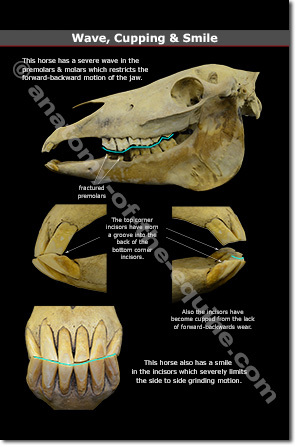 The TMJ plays a huge role in the equine. Imbalance in the teeth often cause imbalance in the TMJ which in turn causes imbalance in the body. Here we show the TMJ as well as the articular disc that sits in the joint. 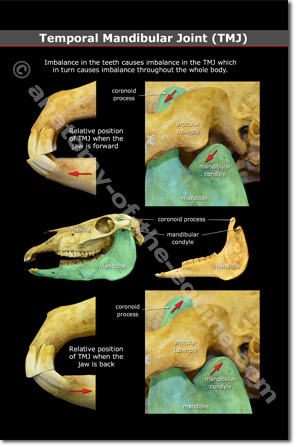 These photos show the relationship of the jaw to the TMJ. Stress on the TMJ can occur from imbalances in both the molars and incisors. 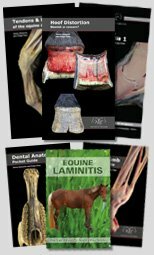 Buy five guides for $110 and save $8 per book - perfect for selling on to client.